Home / Store & Product / How to Upload Product Images? How to Upload Product Images? 1. Click on Image Settings. 3. Once you have set the image sizes, you will only have to upload large images (600px or more for width). The system will auto resize the the images to small, normal and large according to your image settings. 1. Click on the product item (eg: Collegiate Tee) that you would like to change its image. 4. Drag and drop your images into the image gallery. It is advisable that all product images share the same height for small images and same width for all normal and large images. To get a better picture of what a small, normal and large image is, refer to the images below. 2. On the Zoom Option section, select Outer Zoom if you want your product image on your webShaper store to have zoom function outside of the image box. 4. 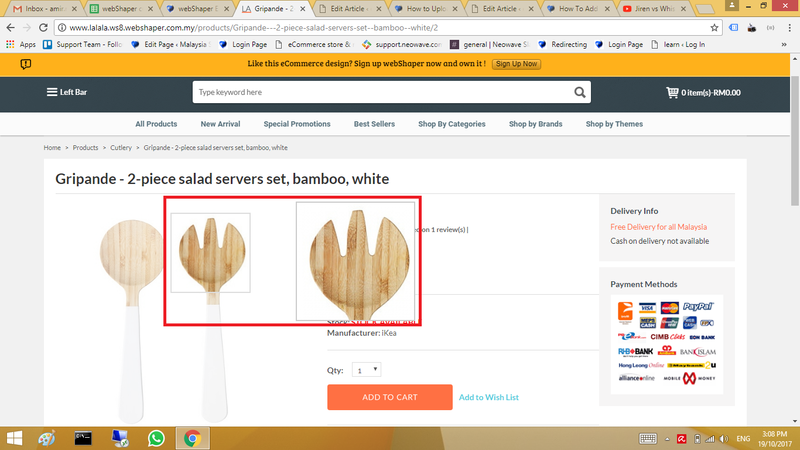 Go to your store and you will see that if you hover your mouse to the image, the zoom will function from the outside of the image box. 5. If you want your product image on your webShaper store to have zoom function inside of the image box, on the Zoom Option section, select Inner Zoom. 6. Go to your store and you will see that if you hover your mouse to the image, the zoom will function from the inside of the image box.